This custom window seat is detailed to match the custom kitchen cabinet doors and trim adjacent to it. It was built to accommodate the dog’s food and water bowls on the left side, have storage in the middle, and a dog bed on the right side. It turns out that it is to cold there, despite adding insulation during installation. The dog now sleeps in bed with the owners, and the right side of the cabinet is now wine storage. These projects have few limits. We always use 3-D models to assist with the design and manufacturing process. These tools are primarily architectural in nature, but they work extremely well with smaller scale projects like this one. A google sketchup model is one of the tools we use to help clients visualize the possibilities for their furniture, cabinet, or remodeling project. 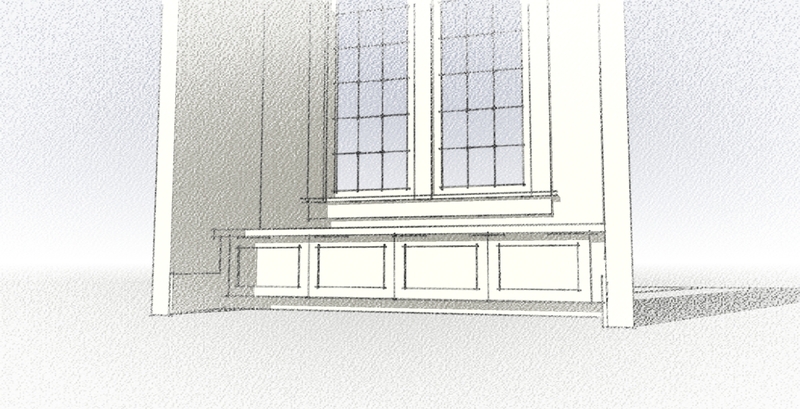 Here is a Sketchup animation of the window seat during the design phase. Sketchup allows you to take 2-D images from any angle. You can add lighting and texture, but we primarily just use it for massing and communicating project details. The shadows, allow for simple light studies to determine how much direct sunlight there will be at different times of year. We can pick the sun location per your latitude and longitude as well as the time of day and year. This is particularly useful for decks and remodels, but also provides some depth to this simple furniture model. Another example of this tool as a visualization aid for residential remodeling projects is in a set of images we presented to clients interested in adding a bathroom and possibly opening up a 1920’s victorian house. We can help with your next project as well! You can upload images through the contact page, or call now to schedule an appointment and we can start moving your project forward.